We can provide tables and seating for any occasion of any size. We stock round and rectangular tables of various sizes, traditional gilt banqueting chairs and very popular Chiavari limewash chairs as well as more informal seating such as patio furniture and even bean bags. 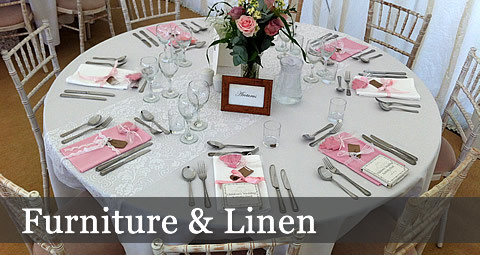 We can supply good quality linen tablecloths and napkins to suit any colour scheme - just let us know your requirements. We could not have had more helpful and cheery support whenever we have used Norfolk China Hire. They always meet our needs with patience & efficiency; we love 'em. A brilliant band of chaps! Thank you for contacting us, we will reply as soon as we can. The quotation tool will now take you through the various categories of items we have for hire; you can jump backwards & forwards to a particular section by using the navigation panel below the list of items, and you can save your progress at any stage in order to continue later.